Hi, guys! I hope you’re all enjoying 2019 so far. Nearly everyone I know in Christmas has been, the exceptions being Sophia, the owner of Naughty and Nice, and Autumn, the owner of Sugar and Spice. 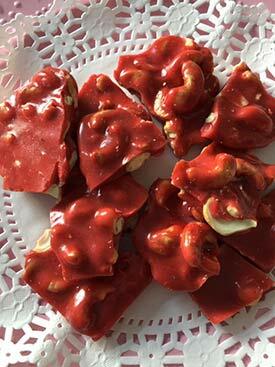 I found out things weren’t working out as I’d hoped with Autumn and her ex-husband, my step-grandson Logan Dane, when I picked up some cashew brittle from Sugar and Spice for Valentine’s. It seemed the perfect choice for my husband Calder’s sweet tooth, until Autumn told me it was Heartbreak Brittle. But while I was disappointed things weren’t going well for the couple, Sophia wasn’t. She and Logan never did get along. I had high hopes for Sophia, too. I thought she and my other step-grandson, Adam, he’s a US Marshal in San Francisco, were the perfect match, but that doesn’t seem to be working out either. Honestly, I was beginning to think I was losing my touch until I began reaching out to previous couples I had matched for my Valentine’s Day survey. I’m pleased to report that Autumn and Sophia are outliers. Still, I haven’t given up on them. I have my fingers crossed that both couples will get their happy-ever-after in ONE NIGHT IN CHRISTMAS, which comes out on May 7. I haven’t been wrong yet, as proved by some of our favorite Christmas couples. Maddie and Gage (you might remember them from THE TROUBLE WITH CHRISTMAS) got engaged on Valentine’s Day five years ago. And I’ll let you in on a little secret, Gage is planning to re-enact the day and the proposal, which I’m sure will make Maddie cry happy tears, as long as they don’t re-enact it exactly. Because that was the same day Maddie found out she was pregnant with Connor. And speaking of O’Connor’s (Connor O’Connor’s, it’s close enough;) Skye has decided her husband is working too hard and has planned a romantic adventure. Liz, Ethan’s mother, is taking care of the kids while Skye and Ethan horseback ride through the national park and then sleep under the stars. Which I have to admit, is a little too adventurous for my taste, but definitely right up Skye and Ethan’s alley. And exactly the opposite of what Ethan’s sisters had planned for the night. A little more than a year ago, twins Chloe and Cat had a set of their own twins and are suffering from what Chloe refers to as mommy-brain, which means they forgot all about Valentine’s Day. But their husbands didn’t . Easton arranged a full day of pampering for Chloe, a shopping spree at Naughty and Nice, and then dinner at their favorite Italian restaurant. While Grayson arranged for his grandmother to look after the kids so that he and Cat can spend the day skiing at Blue Mountain and the night curled up with wine and a movie at the honeymoon cabin on Silver Lake.